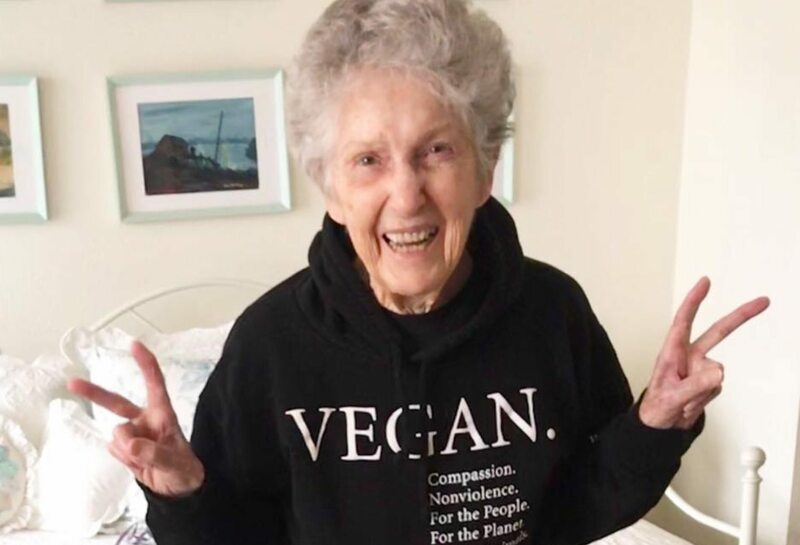 A 97-year-old vegan has said it's never too late to make a change. Anne Evers ditched animal products when she was 95, after watching the documentary What the Health. According to Evers, until then, she had eaten the 'standard American diet' since birth. What the Health opened her eyes to what she describes as the ' extremely negative health, environmental and ethical impacts of animal agriculture' - leading her to adopt veganism. "Do I wish I found this information sooner?" she wrote on social media. "Yes. But once I got it, I made the change and now I'm passionate about spreading the truth. "We do not need to consume animal products to survive therefore we have no right to kill another sentient being and contribute to the destruction of our planet in the process. "The health benefits are just an added bonus. Choose VEGAN. For the people. For the planet. For the animals. IT'S NEVER TOO LATE TO MAKE A CHANGE." Evers has also spoken about how she will never go back to eating animals. In an interview with The Standard, Evers - who says she feels 'wonderful' as a result of her diet - listed some of the benefits of plant-based eating. "I have more energy, I feel lighter and less inflamed, my skin is more clear and I’m moving around better. I definitely think it's keeping me healthier as I age," she said.